The multimillionaire entrepreneur says small businesses need to advocate risk-taking and be willing to let people go. Few recent British entrepreneurial successes have attracted quite as much attention as Innocent Smoothies. Founded in 1998 by three university friends, the brand’s bold branding and reputation as a (relatively) healthy alternative to fizzy drinks got consumers going and it expanded rapidly to become a global brand. In 2013 its founders sold the last of their stakes to Coca-Cola in a deal that valued the company at a cool $500m (£330m). 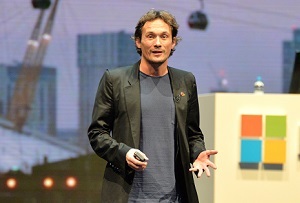 At this week’s Microsoft Future Decoded event one of those founders, Richard Reed, shared his key management tips for entrepreneurs following in their footsteps. ‘There’s a fundamental truth there,’ Reed said. ‘Great people want to work with other great people, and great people want to help other great people succeed. Less good people, less so – they’re a bit more worried about where they are in the hierarchy, whether they’re going to get that next promotion or not. Trying new things is a critically important part of growing a business, and it’s worth encourahing your staff to do the same. ‘A little phrase that was on every wall in every toilet at [Innocent HQ] Fruit Towers was this: "If you’re 70% sure then go for it",’ Reed said. ‘We weren’t saying make reckless decisions, we were saying just think about it, maybe run a few numbers, but don’t try and get to 100% confidence. Much better to commit, make a call, see how it’s going, correct if it’s not right. Behaving ethically and emphasising the importance of such behaviour isn’t just a good thing to do in its own right; it also helps attract the right sort of people. ‘I think that really helps, especially in this day and age and especially if you want to recruit fully-realised, clever, switched-on, socially engaged people - which of course you do,’ said Reed. A business’s values are vitally important, Reed said, so you need to be willing to cut people loose if they aren’t a good fit – a mistake Innocent made in the early days. ‘It was a stupid and naive thought, but I thought there was something unethical about firing people. We were called Innocent for god’s sake, so we can’t ever fire people.